The biomechanics of the spine during golf swing biomechanics and the relationship to cases of low back pain and performance have become of growing concern within professional and amateur golf. Golfing performance is orientated around hitting the ball further and more precise, whilst putting as minimal stress through the spine as physically possible. It is therefore due to this reason that a high amount of studies have been performed in relation to the biomechanics of the spine (typically the lumbar spine) and how performance can be improved. Now, with the growing number of amateur golfers in development, this particular concern grows with importance, particularly with the fact that the majority of golfers do not understand the importance of ‘out of season conditioning training’, which is crucial for preparation for the on-going season. This in my clinical opinion coming from a performance background is one of the most valued reasons for why the incidence of injuries develops, along with ‘under-performance syndrome’. As an Osteopath, I believe it is not only the anatomical factors that should be acknowledged and examined, but in my opinion it is more important to assess and evaluate the whole functional biomechanical relationship between the ground reaction forces to the functional biomechanical loads placed upon the lumbar spine. This is where my background in sports and exercise physiology is perfectly adopted. When we use specific motion of the lumbar spine in the initiation of a proper golf swing, we can see that the deep stabilising muscles are extremely important, as too are the global, prime mover muscles. Vast amounts of evidence shows that the spinal segmental stability during motion is essential to minimize rotational stress on the joints. The deep inner-core muscles that act to stabilise the spine during dynamic motions are more effective and anatomically suited for specific spinal stability and are activated first and are the muscles involved in prime rotation of each individual spinal segment. The fine control of these muscles are controlled by neurological innervations (nerves), whereby, any irritation to the neurological supply can consequently result in functional alterations and performance adaptations. It is widely established that back pain has a huge relationship to spinal instability and visa-versa, which ultimately affects performance. Any decreases of the neuromuscular control will decrease spinal stability. Therefore it is essential to evaluate the golfers swing in detail. Recent reports have shown that professional golfers, as opposed to amateur golfers tend to show better overall body conditioning. They also tend to have greater single leg functional control. In addition there is an advantage in superior club head speed, which is related to the amount of spinal rotation and scapular glide at the top of the backswing. Evaluation of correct technique when performing any activity is important in order to produce an advantage functional dynamics. For instance, if during the evaluation it is determined that the erector spinae and the external oblique muscles (superficial muscles) are firing as the primary spinal stabilizers instead of the stronger, deeper transverse abdominus and multifidi muscles (deep core muscles), then the individual may be compensating for lower back spinal dysfunction. 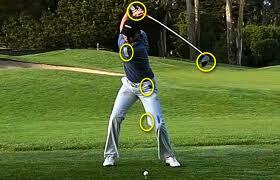 Consequently, this can develop chronic cases of overuse injuries due to poor biomechanics during the golf swing. 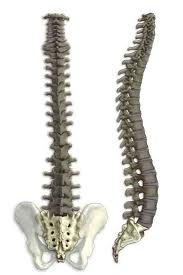 Spinal degeneration is also of huge importance with golf performance, due to the can biomechanical alterations (reduced range of motion, reduced spinal stability, reduced spinal curvature and so on…). The curvature of the spine is of huge importance also in golf as increases lordotic (lower back) curve can increase stress on the posterior segments, particularly during the backswing, and also reduces the range of motion in this area. However, this can result in extension, which then can facilitate improved rotation. Reductions can limit the backswing and directly affects the power generated to ball connection. A decreased lumbar curve (common in the older generation) will also decrease the segmental range of motion. Its effect on the backswing will be similar, however, the approach to improve proper biomechanics in the region will differ. In my clinical opinion, it is extremely important to examine the lumborsacral angle (lower back), which if increased, will result in decreased range of motion within the extremely prominent area of injury within the majority of sports medicine. Evaluation is of the lower extremities and their effects on the postural biomechanics of the spine are very important and should be considered. The lower extremities play an important role in the outcome of the golf swing, particularly the mechanics of the foot and ankle joint and how they impact the ground and react in rotation. Assessing the foot and ankle for any structural defects that may interfere with the normal segmental movements of the spine is of extreme importance in biomechanics. This involves assessing for the presence of pronation and navicular integrity. If dysfunction if present this can well result into biomechanical alterations, muscular imbalances and spinal motion dysfunction, ultimately affecting spinal segmental stability. Since there will always be some biomechanical stress put on the spine and sacroiliac joints during the swing, it is very important to have balance and stability in your foundation, particularly on your backswing. The transfer of force from the back foot on the backswing, to the front foot on the downswing and acceleration, will determine the distance of the ball. The importance of posture and proper spinal biomechanics during the golf swing is essential to preventing injuries in the low back and maximizing the distance and accuracy of golf shots. The lumbar spine must be in a stable position during the stance phase; the lower spinal segments to approximately L3-L4 are locked in flexion and the upper lumbar vertebrae are in extension. The transitional level where there is a slight shift from flexion to extension becomes a stress point for the lumbar spine. It is necessary for there to be normal neuromuscular function in this phase. When evaluating a patient’s stance phase, I have found that if there is interference with the neuromuscular innervations, the deep muscles, particularly the multifidi, the erector spinae, and external oblique muscles are activated too soon. I’d resally love to be a part of online community where I can get responses from other knowledgeable peoplee that share the same interest.